Does germannerd belong in this group? Because.......I'm....a clown? I consider myself to be the living incarnation of the Clown Prince of Crime himself, the JOKER. 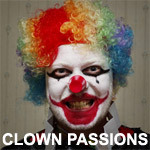 But I also have a weird thing for clowns. HAHAHA!! Does monsieurloyal belong in this group? Does aaron77292 belong in this group? Does desertjoe belong in this group? Looking for my special clown I'm a single mother of 1 child. I love to laugh and to make others laugh. Im looking for someone who loves kids, maybe even has one of his own, who loves to laugh and just enjoy life. Does youngmomma belong in this group?